Play in Progress: Developing TOLLABOX! The principle of eco-joy: Your Green runs on fun! If this is the first time you’re hearing about the Green School you must have been living under a rock. 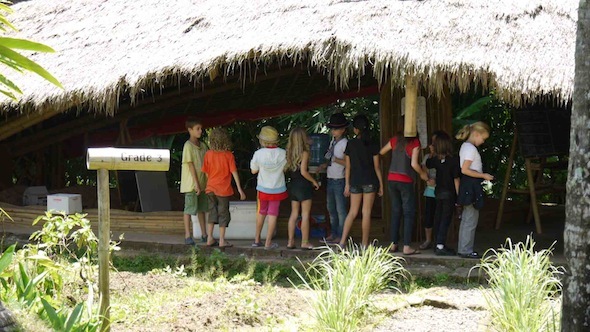 There is probably no other school in the world that has gained such an international awareness in such a short time: Created by Cynthia and John Hardy, The Green School started its operations just three years ago. The idea of having a school that puts eco-literacy in focus, the beautiful surroundings and the energy of its founders have generated quite a stir: John’s speech at TED in 2010 was widely viewed and several newspapers and TV stations have spread the word, to say nothing about social media. So, due to this huge reputation of the school, I had a hell of a respect when I first contacted Principal Stephen Milverton, and was enormously happy to be able to visit the school for a full two days. Stephan had the idea to integrate my presence into the learning of the 4th grade, because they were just focusing on the Berlin Wall – as a witness of that historical moment. And, after having had a rich and meaningful time in Bali in the Green School, after having met and spoken to Cynthia Hardy and many members of the staff, parents and kids, after an exceptional stay at the Bambu Indah, an eco-hotel owned and run by the Hardys, the theme “no walls” is the strongest coming to my mind. The philosophy of the learning is “no walls”. There is a sense of openness and freedom all over. 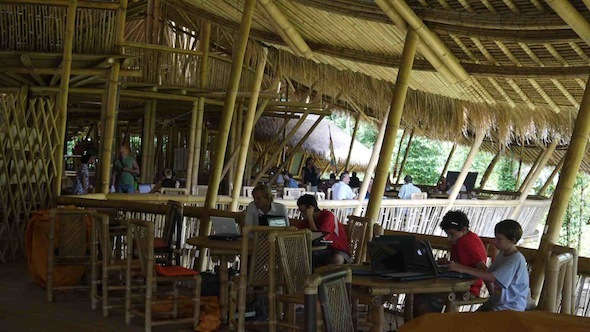 The whole bamboo architecture of the Green School is open to nature, to Bali’s velvet-like air, to light and the sounds of the rainforest and of the rice fields around the place. You might think that this distracts kids, and yes, it does – but it actually fosters their learning and creativity, it gives them a feeling of being integrated in the nature and a better understanding of what happens around them. Each class has gardens around them and a task to perform: Grow plants or take care of some little animals. Sometimes parts of the magnificent bamboo buildings deteriorate and need to be re-built, and it happens just on the spot, whereby kids learn about life cycles and renewal. The subjects are interlinked: In the class where I spent a couple of hours, the theme of the Berlin wall was not just about history – the fourth class has worked on a play about the feelings of the people on either side of the wall as the wall was built, during the cold war when it stood, and as it finally came down. Students created on a gallery of Berlin-style graffiti as well as written essays about freedom and state observation. They were all well informed and very curious! They quickly found out that I was not only there on November 9th, but that I spent the first 15 years of my life behind the Iron Curtain and lived in a dictatorship as I was born in Romania. The questions just didn’t stop! They wanted to know if I knew people who tried to escape the regime - and they were almost close to tears imagining people who risked or even lost their lives for freedom. Suddenly, we discussed Lybia and what’s going on in the world, and I notice the authentic interest and sensitivity to global issues that those kids have developed! Steve Milverton explains that the schools first built upon the Cambridge International Curriculum and now slowly creates its own curriculum and methodology with a focal point on eco-literacy and holistic education. Eco means basically green - it’s about developing an understanding about what the nature and our planet need. Holistic means the overall perspective and the dependence of everything to everything. They learn it here, by doing, watching, feeling - in the middle of nature. Never have I experienced a school that is so friendly and open to its community as the Green School is. Parents can hang around in the premises. They get Wi-Fi access around the snack shop. The very yummy lunch is for 20.000 Rupees open to them and school visitors. It feels good to be around, the conversations are relaxed; I make friends and learn about life in Ubud and Bali. Even if everybody enjoys this feeling, it is also subject to controversial discussions, and the school now tries to find ways to reduce the “zoo-effect” but to maintain an open spirit on the premises. Personally, I feel that being integrated as a visitor into the students’ learning, letting them ask me questions about how I experienced the fall of the Berlin wall was a good approach. 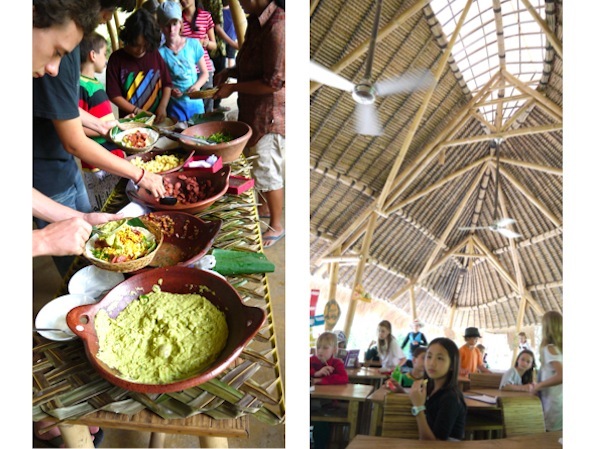 What I experience at the Green School goes beyond what is typical for international schools. 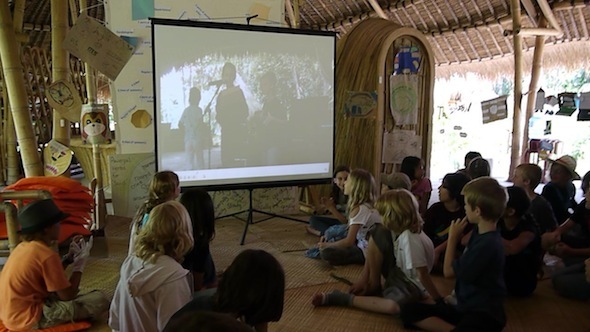 When learning about Mother Earth and what our planet needs, children get a connection to cultures all over the world. 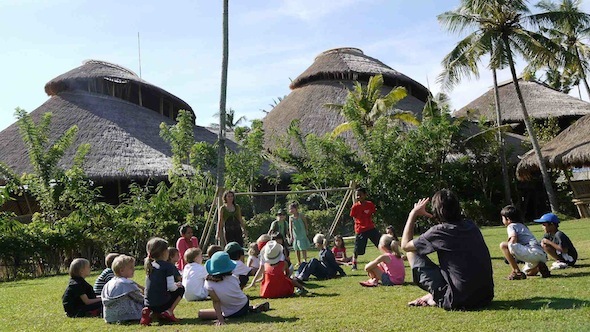 The Balinese culture is part of the school culture. Each class has a second Indonesian teacher, and the older classes starting 4th have an additional local teaching assistant. 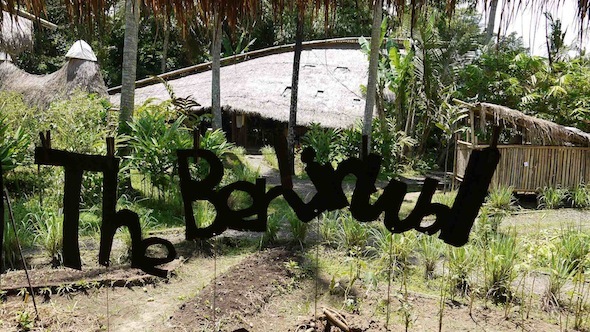 Children from Bali get scholarships, and if you want to support this, donations are needed! Steve Milverton explains that Indonesian is part of the school curriculum as an “infused” language: The Indonesian staff is taking bits and bites at beginnings, then bigger parts of the lessons in the local language (which is by the way quite easy to learn, as kids tell me – “almost mathematical”). The result of all this is the principle of eco-joy: The Green School community lives green behavior and sustainability by love for nature, not by restrictions. While living in the middle of it, experiencing its generosity and fragility, the kids take care of nature and responsibility for it. They learn what is right and wrong through enjoyment. And through this they go on a playDUcative journey to become global citizens who will take this love and enjoyment into the future and make better decisions for the planet then our generation did. I cannot find the appropriate words to express my huge thanks for being able to have this rich experience at the Green School. Dear Cynthia Hardy, dear Steve Milverton, dear Derek, dear staff at The Green School and at the Bambu Indah: Thank you so much for everything! I know that there are also difficult moments in the development of a school, we had those at Phorms too, and that it needs a lot of inspiration and hard work to overcome them. The Green Idea is worth it!